As a landscape photographer, I’m fascinated by both the grand landscapes that are not of our own creation, and those that we have artificially created. Professional photographer Les Walkling once stated that landscapes possess our imagination, inspire reverence and awe and guide us back to where we have come from. We only have to look at the history of landscapes as art to understand the connections and significance we place on our lands. Nowhere is this connection more clearly evident than in photography. As an Educator in the area of landscape photography and post-processing skills, I hope to convey a deeper appreciation for the land and to make photographers think about the stories their photos can tell or the impressions they may leave in the viewers’ minds. I have been a professional photographer for twenty-four amazing years. I remember with a bit of nostalgia, starting out in a humble darkroom set up in a spare bedroom with my little Roliflex SL35 and rolls and rolls of Ektachrome film. The industry of today looks nothing like it did in my early days. The rapid advances in technology and creative techniques have kept my learning curve steep, but that is what makes it such an exciting and challenging time to be in the industry. The advent of digital has revolutionised photography as an art form. I met Mark Stothard, one of the owners of TRUE NORTH, at a photography workshop that I was running in Perth. Mark is a serious photographer and he asked me if I could help him out with some of his work. We became friends and he asked me if I would like to teach photography on a TRUE NORTH cruise. I think I have done as many as eight trips now. Each one of them has been an memorable experience. What have been some of your photographic moments on the TRUE NORTH? I have had some amazing experiences on these trips. The boat can get you some of the most remote and spectacular countryside. 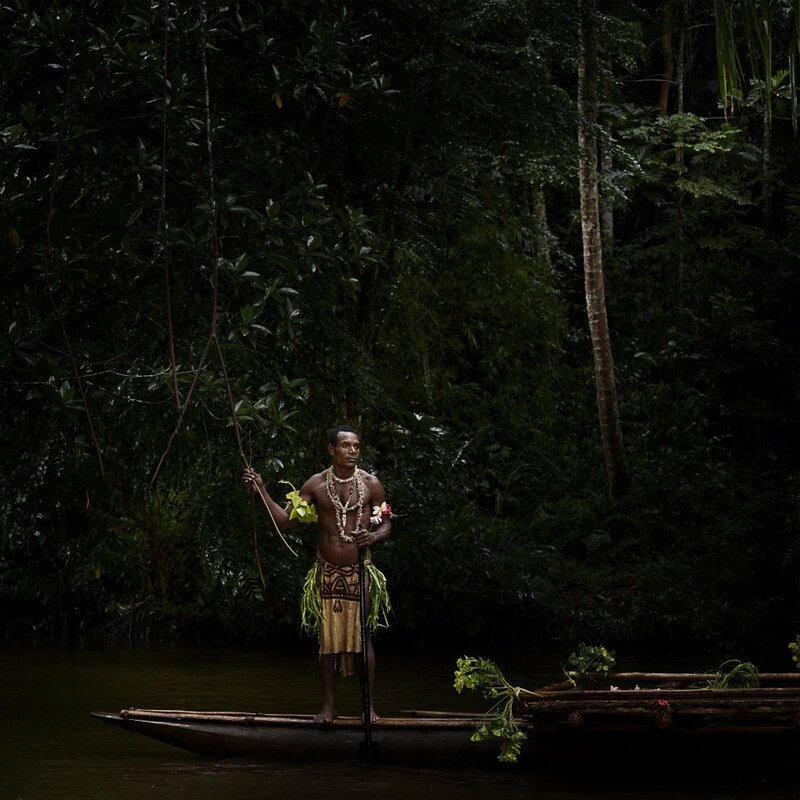 I remember one moment in Papua New Guinea when we were being taken up a river on traditional canoes. It was looking pretty stormy but it was so warm. Eventually it started to bucket down and everyone was scrambling to keep their cameras dry. I had the good sense of bringing a big garbage bag with me and it covered my whole backpack. I was getting offers to buy my garbage bag but it wasn’t for sale. We all got drenched. When we finally arrived at our destination two locals came at us with spears. At first we weren’t sure if we should run or stand there and hope it was all part of the show. Luckily it was but it got the heart pumping a bit. I have a favourite photo of one of these guys on the canoe and it really portrayed the scene and the feel of the day. There are so many other times I was in awe of what we were looking at. I think the first time you land at Eagle Falls in the helicopter and witness this remote paradise you just know it is going to be a good day. I have photographed volcano’s, remote villages, tropical islands, ancient rock art and prehistoric crocodiles. It has been a dream to be given such amazing opportunities for photography. I love this image. The pose, the jungle, it really has a feel about it. I used a portable lighting system from Elinchrom to light the subject, my wife held the flash. What I like is the guy wasn’t aware I was shooting him so it is very natural. This was such a tough shoot. Helicopter, refreshing ale, late afternoon light and five photographers to capture the scene. This is the first time I have been able to get to this spot for a sunset. It is extra special because there was no one else. It is so hard to get to, boat or helicopter are really the only options. What a way to cool off. 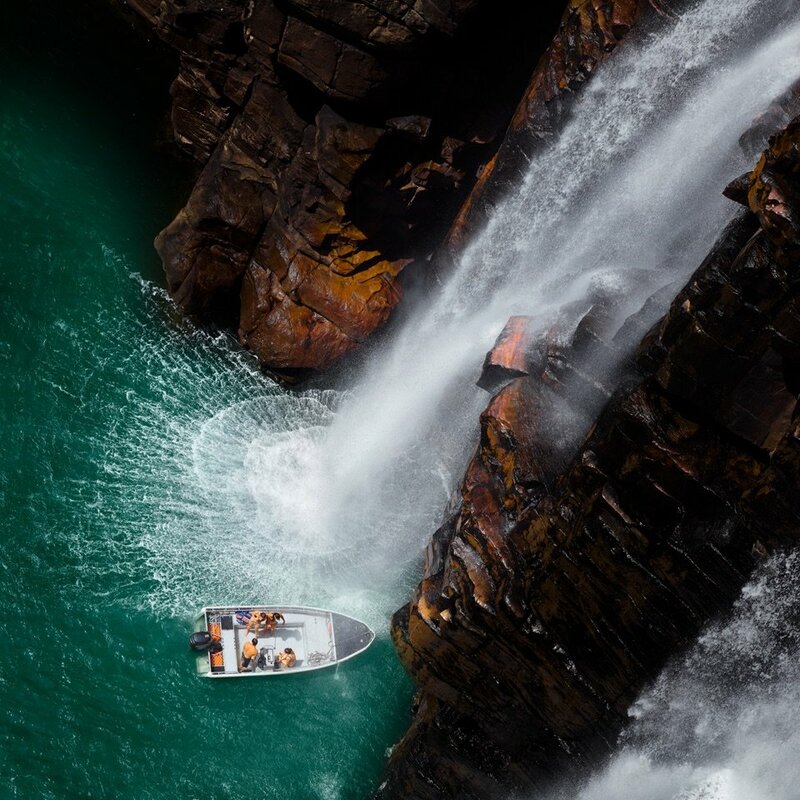 During the Kimberley cruise the captain noses the TRUE NORTH right up to the base of the falls. Passengers can step under and have a quick shower to cool off. A very popular activity. In this shot however, some of the crew grabbed a tender and had their own private shower. I was up the top of the falls. There is a walk path you can take, a steep one at that so not for the faint hearted! 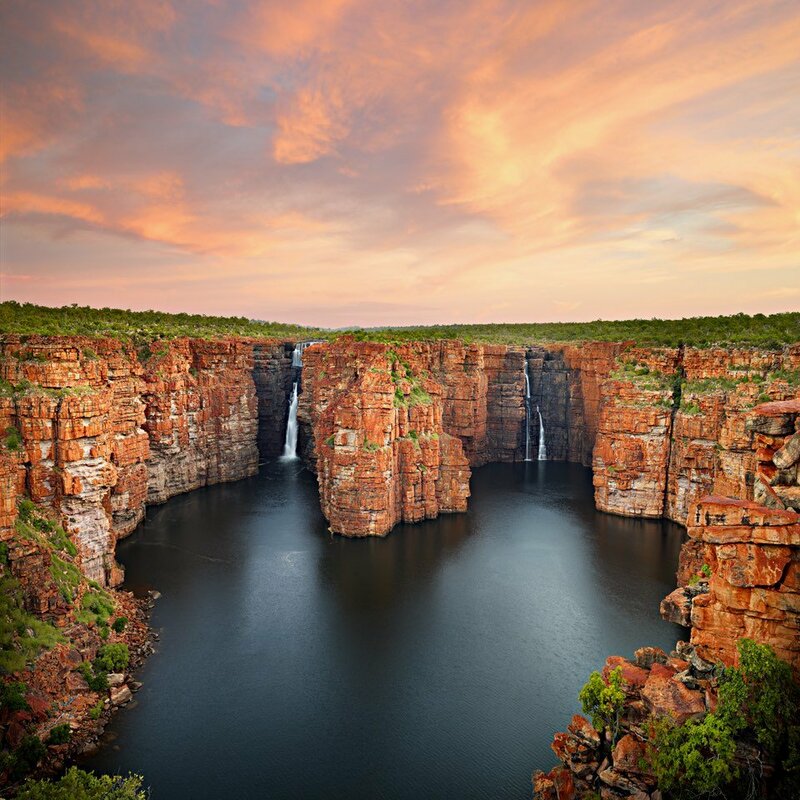 This is my favourite part of the Kimberley coast. TRUE NORTH anchors here very early in the morning. It is a narrow section of the river. When you wake up and look out you are surrounded by mountains and hills, some very steep. There are always crocodiles in the water surrounding the boat and it is always very calm. Wow, what a spot. This small band of islands in PNG are absolutely stunning. From the boat we snorkelled across to the island. 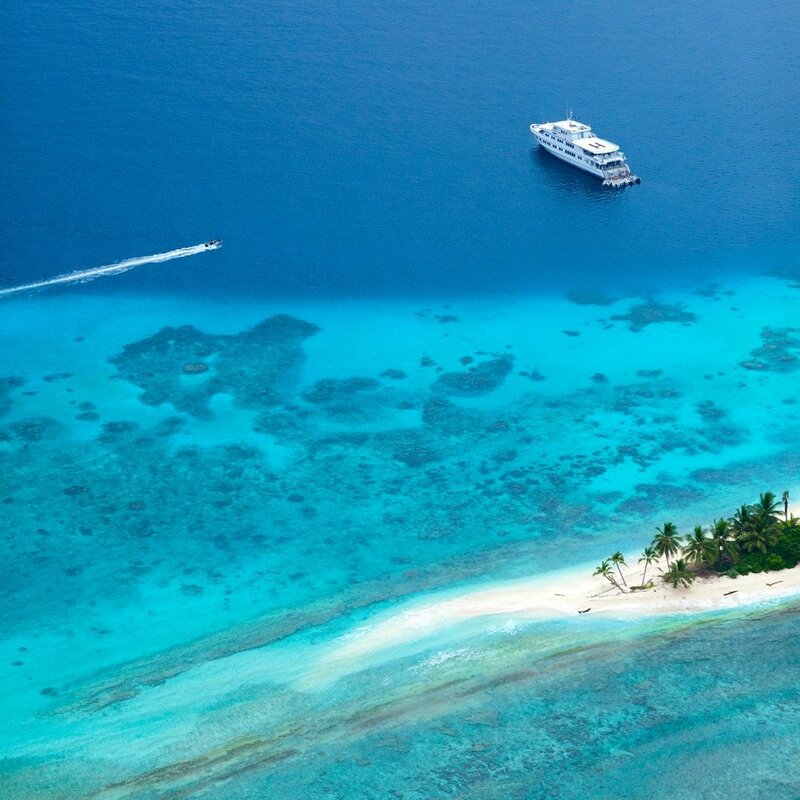 The water is a perfect temperature and the coral is teeming with beautiful fish. We had this island all to ourselves for the day. I photographed it from the ground, from the boat and from the air. Would love to go back one day. I love Eagle Falls. You don’t see it in this image but you do see what you look out onto when you are there. 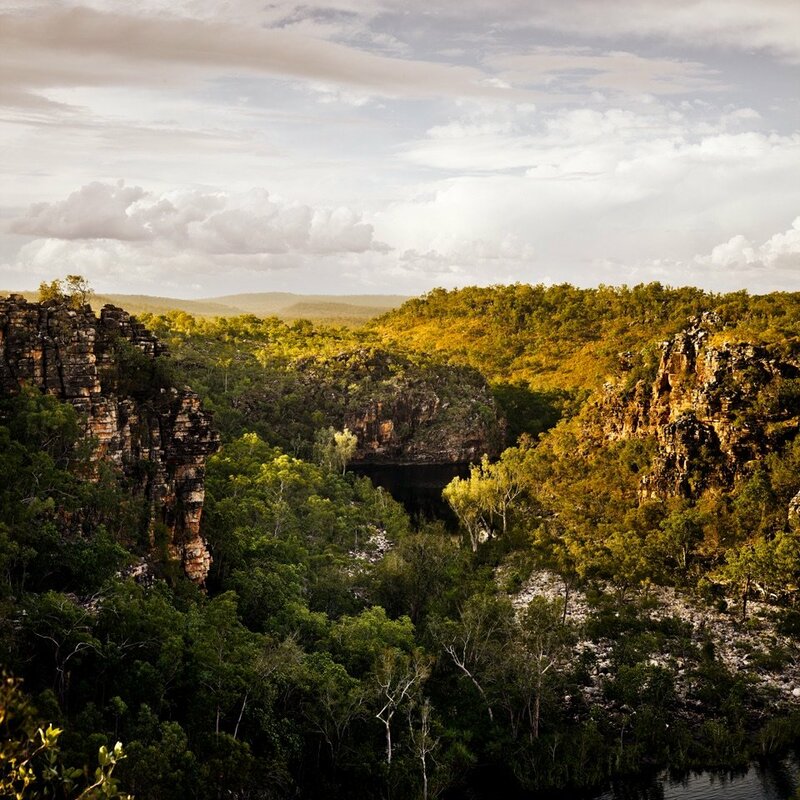 Mark Stothard took me to this spot which involves a bit of a bush walk. Then you have to walk out on these narrow spires of land, one slip and you are not coming back! It is a prehistoric landscape. Perfect for photography. I think it is the ultimate day out on a TRUE NORTH Kimberley cruise. All the passengers and crew are taken out by helicopter. It lands on the edge of the falls and you spend the day swimming, drinking and eating from the amazing BBQ the chefs put on. Possibly one of the best things I have ever done in my life.